On January 5,we went to Miyagawacho,Kyoto. 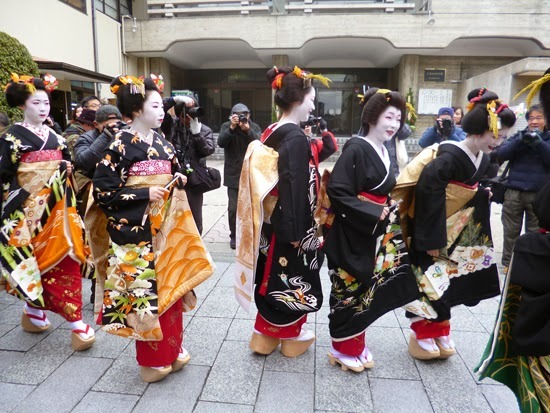 We could see an event of New Year's greeting by maiko and geiko. but every year,in this greeting event,it is custom for them to wear black kimono crested. 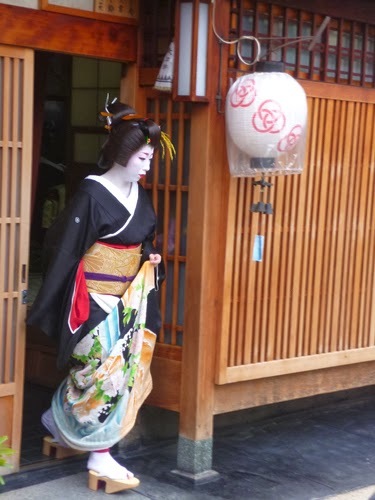 Young maiko : They wear black frisode with gorgeous designs on both shoulders. 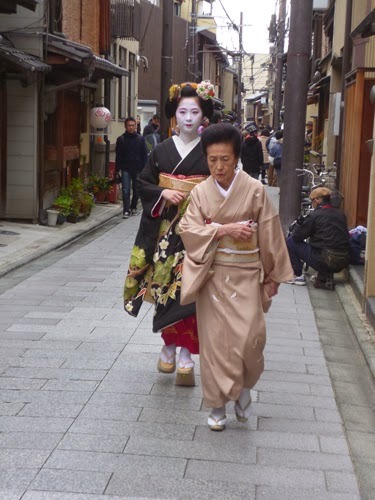 Elder maiko : They wear black furisode with no designs on both shoulders. 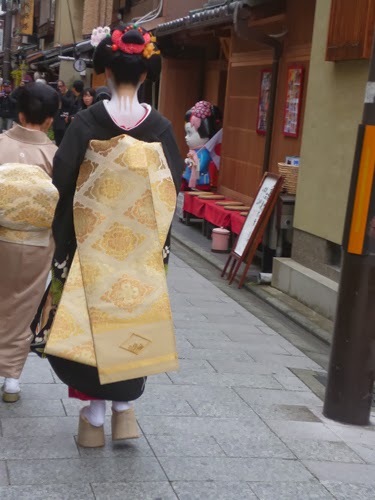 Geiko : They wear black tomesode with no designs on both shoulders. And in the way of tying an obi belt,there are some differences between maiko and geiko. Very nice! 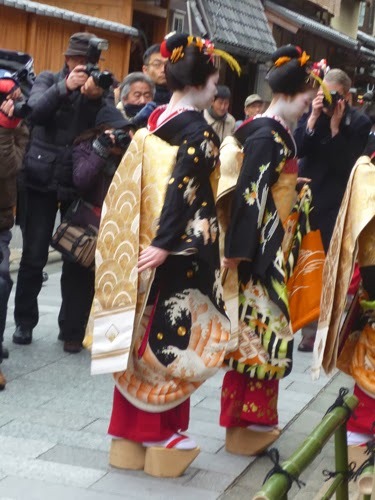 I love to see maiko and geiko all dressed up! 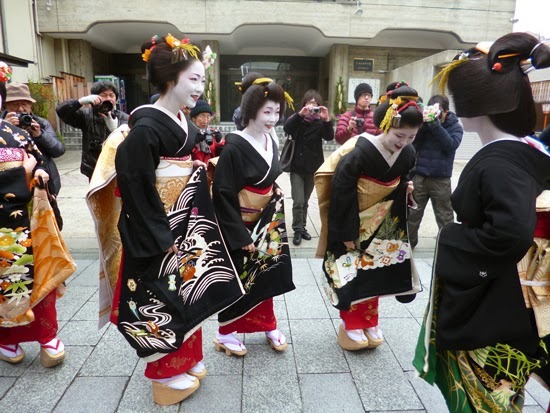 Normally,at the beginning of the year,they hold the opening ceremony and greeting event on January 7,but only in Miyagawacho,the greeting event is previously held on January 5. Great! I love those kimonos, even if they are black. I have nothing against black. It was an interesting display, I guess. Happy you! Indeed,it is funny display :) I think this is maiko. Yes,luckly we could see these scenes. Thank you for sharing these beautiful pictures, Kumiko-san ! So much detail :) I see that they all wear red underkimonos and the maiko's kanzashi have a flower arrangement on the left and yellow rice (straw ?) on the right. The colourful designs show up real well against a black background. Is New Year the only time they wear these designs ? Kumiko, thank you for sharing real pics of this amazing event!!! 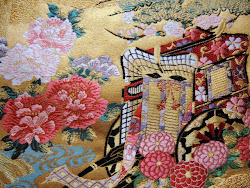 yes, crested kuromontsuki are the most official kimono and traditionally worn around new Year celebration events! That's right,it is rice straw. Indeed,the kimono patterns contrast well with black background. No,another greeting event is held on every August 1,called "Hassaku". That's right,you're well informed about their kimono! To my surprise,you know the word "kuromontsuki"! You know better than me.